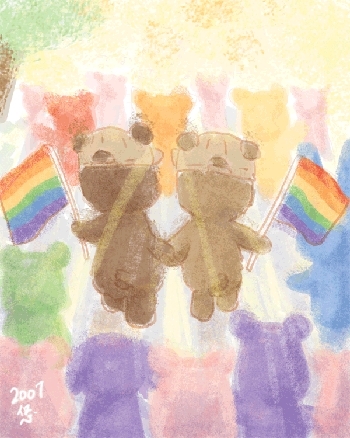 On August 11, 2007, the 6th Tokyo Pride Parade with nearly 3,000 participants hit the streets of downtown Tokyo under the blazing August sun (English news video here ). The parade was first organized in 2000 and has been held intermittenly since then. Initially named Tokyo Lesbian & Gay Parade, the event has a new outlook with a more inclusive and internationally recognizable name, the Tokyo Pride Parade, which reflects the organizer's stance to embrace and celebrate other sexual minorities such as bisexuals and transgenders. This year's Pride marked several small but significant changes in social attitudes. The Ministry of Health, Labour and welfare, the Tokyo Metropolitan government as well as other governmental institutions officially supported the event in various ways. Otsuji Kanako , an openly lesbian candicate in the recent upper house elections, gave a speech at the end of the event. Althought the TPP drew a few thousand participants and spectators, there are still many people in Japan who remain silent and are reluctant to come out to people around them .